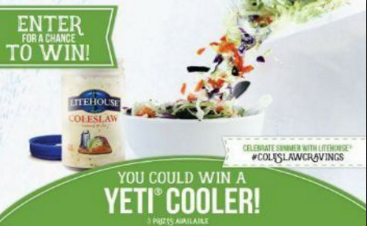 Litehouse Foods Coleslaw Sweepstakes – Win a Yeti Cooler! Win a Yeti Cooler (3 winners)! ENTER SWEEPSTAKES HERE – Litehouse Foods Facebook page. ENTRY LIMIT – Entrants are eligible for one (1) entry daily during the duration of the promotion. ELIGIBILITY – The Promotion is open only to legal residents of the United States, the District of Columbia, (excluding Puerto Rico and any other U.S. territories) and Canada (excluding Quebec) who are 13 years of age or older and have reached 13 years of age in their state as of June 18, 2017. SWEEPSTAKES ENTRY PERIOD – The Promotion begins at 09:00:01 Pacific Time (“PT”) on June 18, 2017 and ends at 23:59:59 PT on July 8, 2017. PRIZES – 3 winners will each receive a Yeti Cooler.